Description: Custom crafted of Solid Brass by skilled artisans in the USA, this Fulton Prime sconce projects beautiful ambient light through Beige Iridescent art glass panels with a matching bottom diffuser. 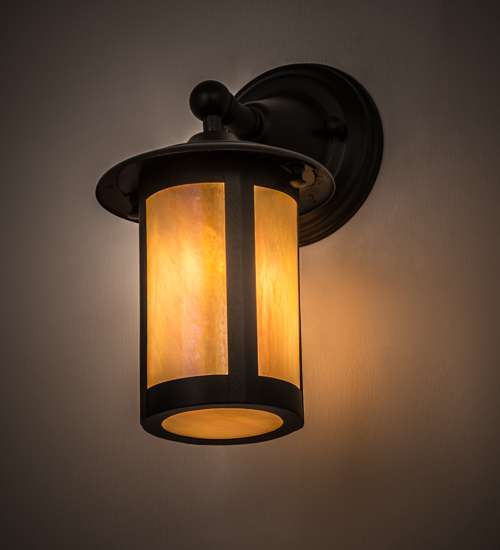 This wall luminaire, which is UL and cUL rated for indoor and outdoor applications, features a distinctive frame with hardware in a bold Black finish. This Craftsman Signature fixture is available in custom sizes, colors and profiles, and with dimmable energy efficient lamping options, to meet your lighting needs.